To complete the steps in this guide you must have log in details for the appropriate ZSSP. Which Zerto Self-Service Portal should I use? To create a VPG for Disaster Recovery to the Cloud or Workload Migration, use the Zerto Virtual Manager (ZVM) Web Client in your local environment. If you want to create a VPG for Journaling Protection, run a test or live failover, or move a VPG, access the ZSSP in the appropriate UKCloud zone. If you want to create a VPG for Disaster Recovery to the Cloud or Workload Migration, use the ZVM Web Client in your local environment. For detailed instructions, see the Getting Started Guide for the UKCloud Portal. In the navigation panel, expand TOOLS and then select Journaling Protection (Zerto). 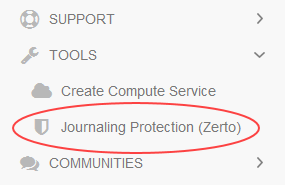 On the Journaling Protection (Zerto) page, click the Go to Zerto Login Page link for the appropriate UKCloud zone (for more information, see Which Zerto Self-Service Portal should I use?). 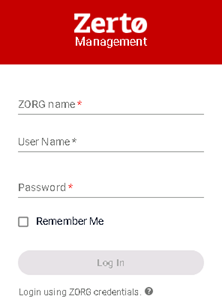 Enter your log in credentials, including your ZORG name. These credentials are different from the ones you use to log in to the UKCloud Portal. If you're not sure what they are, raise a service request through My Calls. After you log in, you'll see the main ZSSP page.